In the last post, I wrote about my day out in the desert, watching rallyists in action at the 2016 Maruti Suzuki Desert Storm rally in Jaisalmer, Rajasthan. In the 6th and final leg of the rally, as the competitors raced towards the finishing point at Sankda in Bhilwara district of the state, the media covering the rally made their way to Jodhpur, where the rally was scheduled to culminate officially and the winners were to be felicitated. While the champagne showers and celebrations went on till late in the night, it was at the Award Ceremony the next afternoon that the elaborate results in all categories where formally declared. This was a good opportunity to see the participating teams together and also connect hitherto nameless faces to names and understand their roles in the rally. For me, the most amazing part of the award ceremony was not the prime winners, for after following the rally for 3 days, their names hardly came as a surprise. It was the many participants that left me awe-struck, for they looked most unlikely people to indulge in adventure sports like motor rallying. How looks deceive and how we stereotype people! It was a big lesson in not taking people at face value. While the rallyists were being felicitated inside, their winning machines had been put on display in one of the gardens. 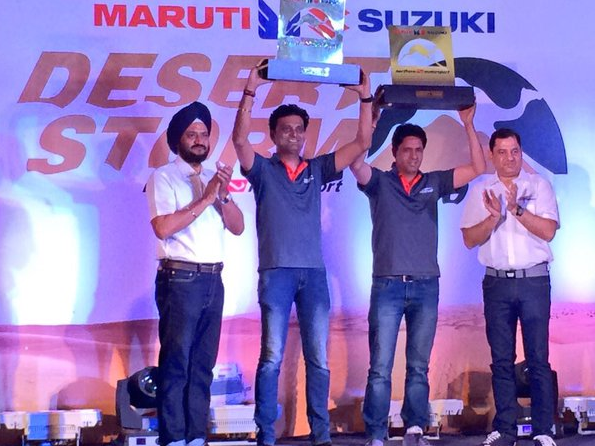 On one side stood Xtreme category winners Suresh Rana and Ashwin Naik’s Maruti Suzuki Grand Vitara, with 1st Runner-up Amanpreet Ahluwalia and Virendar Kashyap’s Maruti Gypsy giving it company. 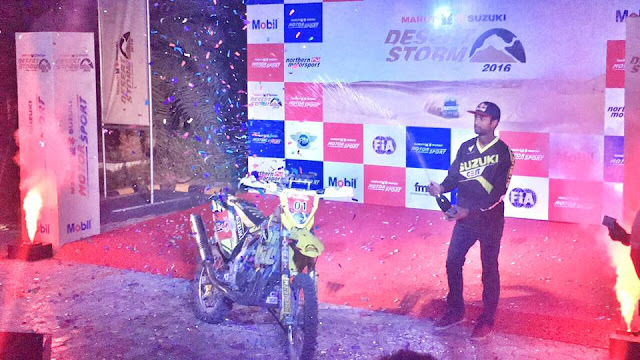 Close to them and being gawked at by one and all was Moto category winner CS Santosh’s Suzuki RMX450Z Rally. It was a delight to check out these mean machines from close quarters and marvel at the toil they undertook to emerge the leaders along with their riders. Displayed alongside these stars of the rally were fancy quad bikes that seemed to be catching every onlookers fancy. And It’s a wrap. Rally On! 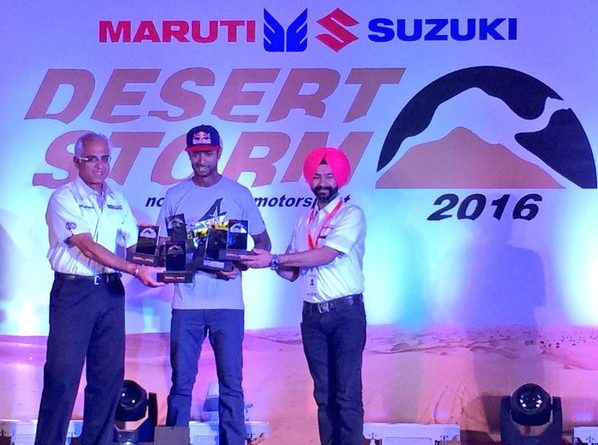 So THIS is how the experience of covering the Maruti Suzuki Desert Storm 2016 panned out for me. Till now so far as I was concerned, motor rally was a distant sport, something relegated to the small columns of the sports pages of newspapers. It was a distant sport also because I had never really bothered to understand the nitty-gritty that goes into making rallying the phenomena that it is gradually becoming. The popularity of this sport is growing in India and all the laurels for rallying’s exponential growth in the country goes to the passionate officials, rally marshals, rallyists and the crew members who are all working with great enthusiasm to take this sport forward. Needless to say, rallying is a tough sport. It’s not just about speed and stamina. Luck too plays a big role in determining how a race ends for a rallyist. There can be technical failures and errors beyond a rallyist’s control that can mar his performance on the tracks. Mix a fine concoction of passion, speed, stamina, focus and luck, and it’s then that you get an ace rallyist! Covering the Desert Storm was a privilege and it was wonderful to see and understand this fascinating sport from such close quarters. Kudos to Team Northern Motorsports and Maruti Suzuki’s motorsports division for the precision with which this event was executed – with 200-plus participants, over 2000 kms of diverse Rajasthan terrain to be traversed and the energy-draining 43+degrees heat, only a team with single-minded dedication could have executed this rally with this exactness. 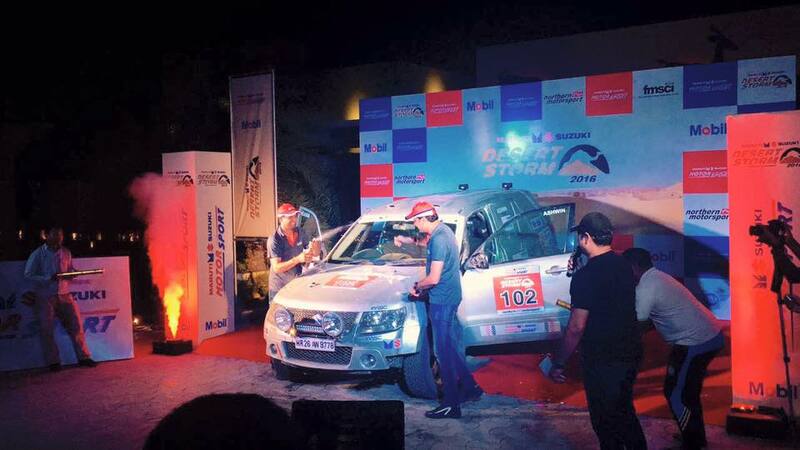 Great write-up and indeed kudos to the Maruti Suzuki team for the success of the rally. You experience has now also got me interested in rally, will the sport closely now. Cheers! Wow! Covering the Desert Storm was one incredible experience for you I'm sure. Super jealous but still looking forward to more of such experiences on your blog. Also, where can one learn more about the rules and regulations for newbies who want to participate in the rally? Interesting article, thank you for sharing. Indeed so much hard work goes into putting these rallies together. Big on logistics and planning.